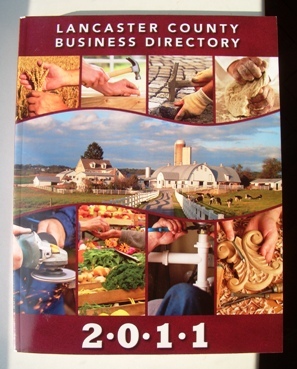 I picked up a copy of the 2011 Lancaster County Business Directory on my recent visit to Pennsylvania. If you want to find a business in Lancaster County, this is the guide to have. The 448-page 2011 edition has a circulation of 60,000 and can be found at area businesses. Amish shops, especially retail stores, often have copies of the guide near the entrance, free for the taking. I actually snagged mine at the Gordonville Book Store while doing a little book shopping. The guide states that there are 25,000 businesses in Lancaster County, though last year’s edition only claimed 11,000, so either they found a lot of new businesses somewhere, or perhaps expanded how they counted a business (geographically?). Either way, there are a lot. Somewhere between 2000-2500 of them would be Amish, though Amish companies are heavily represented in the directory itself. Mennonite and English firms can be found as well. In addition to Lancaster businesses, you also find other PA businesses and even some out-of-state companies jostling for space in the LCBD. Seems everybody wants to be seen in this thing. I always enjoy flipping through the LCBD. I guess for me it’s kind of like Super Bowl commercials are for some people–usually you skip the ads, but here the ads are the attraction. In the LCBD you can find products and businesses that you don’t see everyday, from a wide range of companies. I especially enjoy the colorful, creative, sometimes clever product pitches. It also gives you a good sense of what kind of economic activity is happening among the Amish and their Lancaster neighbors, and who (and what) they are selling outside of their communities. Like any other entrepreneurs, Amish business people understand the value of advertising, and since they do less of it online, the Business Directory can be an important way to get exposure. To give you a sense of the guide, in addition to the many furniture shops and builders, a quick scan reveals air motors, a bucket company, a gourd seller, Maytag washer repair, stoves, spindles, solar lighting, organic feed, cart and wagon shops, Amish roofers, blacksmiths, bakeries, a butcher, waterless toilets (“Ideal for sheds and cabins”), auctioneers, toymakers, and the list goes on and on. You’ve also got non-traditional ads, such as a spot for the Clinic for Special Children. 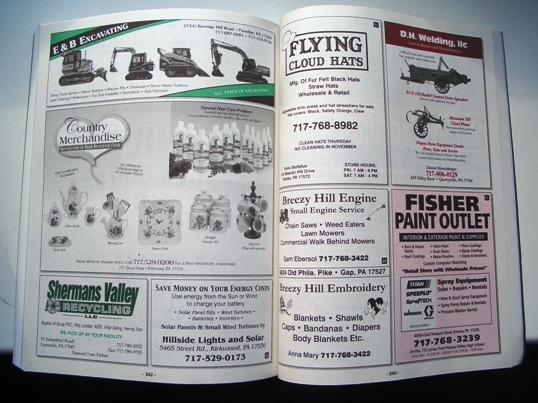 The book offers full-color, glossy ads which occupy the prime middle section, and monocolor ads that take up the front and back. 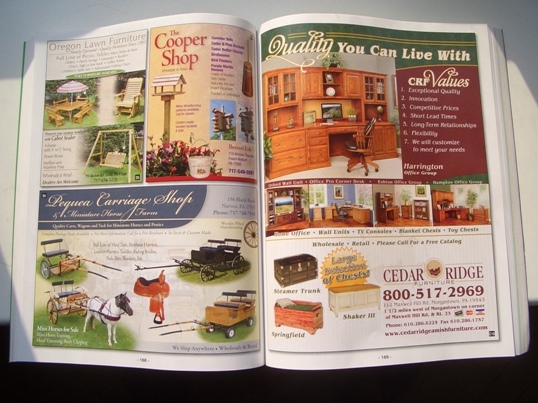 The full-color ads tend to be the big Amish furniture makers, Amish contractors, and equipment dealers. In the monocolor section you find more of the smaller businesses who cater to an Amish clientele, like buggy shops, an Amish hat seller, dry goods, and crafts stores. These are often business-card sized ads. The guide also has two indices–a categorical and an alphabetical index–handy if you have an idea who or what you’re looking for. 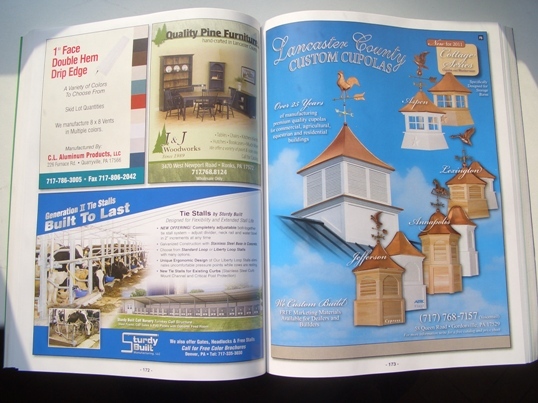 The Lancaster County Business Directory is the standard when it comes to business listings for Amish and other companies in Lancaster County. I realize I’ve just given them a small commercial here, but I’m not getting a nickel for it–I just happen to think it’s a pretty nifty guide. 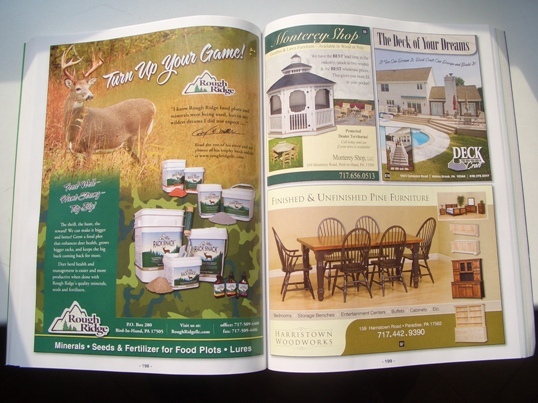 If you’re not able to travel to Lancaster to pick one up in person, you might try the website: davcoadvertising.com, or phone: 800-283-2826. Wow, that is some directory!! Wish I had a copy of one, that looks like it could be interesting just to thumb through. One of the things that does for me though is remind me how congested it is in the east. Been so long since I have been back there. Not sure I would like all that traffic now, and so many people. Thanks for sharing Erik, this was very interesting! What a great way to support local, small businesses! I wish my town published something like this. Unfortunately, I think we have more Wal-marts, per capita, than just about anywhere else. I would really like one of those, too. It would be great when I am touring the area to see some local Amish businesses. Some places don’t advertise and you don’t where to go. It does look like a great book to have. Wouldn’t mind having one myself. I want and checked out the web site,they charge you for the directory. $8:00 for each one. Shoot, guess I will have to wait until I go down again. Have a good day. Thanks for the “look”, Erik, and for the URL, Damon. How much do the Amish use (via other people, I’d guess) the internet for sales? (Alice Aber might have some thoughts on this) I ordered some bakery goods last year from a small Amish “bakery” in Arthur, IL—shipping was as much as the items, but I wanted to try the cranberry-rhubarb bread and peanut butter whip & I think some preserves, too. I paid the cheapest shipping (figured I could warm up the bread in the microwave if it arrived stale), but they sent it “express”, anyway, with no extra charge to me! It couldn’t have taken even two days—maybe one! I found the bakery online through the online Arthur Amish shopping “guide”. I picked up one of those LCBD’s a couple years ago and that’s how I’ve found all of these neat little Amish businesses to go to. I’ve been enjoying this site for a couple weeks now and finally decided to join in. Never done anything like this before but like the rest of you I’ve always had a keen interest and love for the Amish. I’ve been going to Lancaster for years and then finally got to go out to Holmes & Wayne counties in Ohio last year (actually went in the spring and again in the fall) and that’s when I discovered that all Amish are not alike and that there’s a whole world of communities out there that I never knew about. So now, with the help of the internet and the Amish newspapers I’m able to explore so much more than I ever thought possible. And thanks Erik for such a great and informative site! BTW, after seeing and reading about the different buggy styles here, my husband & I took a ride down to Dover, Delaware last Saturday (where I never knew the Amish even existed)and sure enough found their community and saw lots of those “hearse” type buggies. The back of them are shaped like those in Ohio and infact their homes are similar too in the style of their curtains & all. We came upon a great general store called Bylers (1368 Rose Valley School Road, Dover, DE) where all the Amish seemed to shop, and they had some great,cheap prices on food and delicious Amish baked goods. Debbie we’re very glad you paid a visit~! Looks like our paths almost crossed in Dover there 🙂 I’m thinking the Dover Amish are going to become known as the hearse Amish or maybe “undertaker Amish” for their buggies. I popped into Byler’s there as well, it is a good place if you are looking for food. I did see at least one Amish family in there when I was there. I got some peanut butter of course. Alice Mary, a very good question on Amish promoting businesses online. It depends. Some do use it by selling through other sites who retail their products; some even have their own sites, but are typically run by another person. Damon thanks for sharing the online version, I had forgotten about that. Great to have that available too. Richard that is interesting, have you noticed any big changes since the 80s? For me, just over the past few years, the color glossy ads seem to have expanded. Lanore I didn’t know they charged you online. Maybe that covers the shipping. 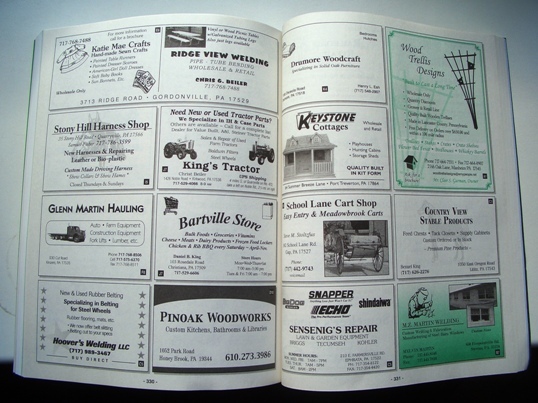 I don’t know if there is a business directory for my area, or if it simply has been replaced by the phone book. There might be, one probably has to get a BD at the chamber of commerce or something. There was a Canadian TV show called “Ancestors In The Attic” that, in one episode, explained how one could use Business Directories from throughout the years to potentially find your ancestors and what they did for a living. Mind you, you do have to have an idea of what they did and be sure that they were in the area you’re looking at the time. 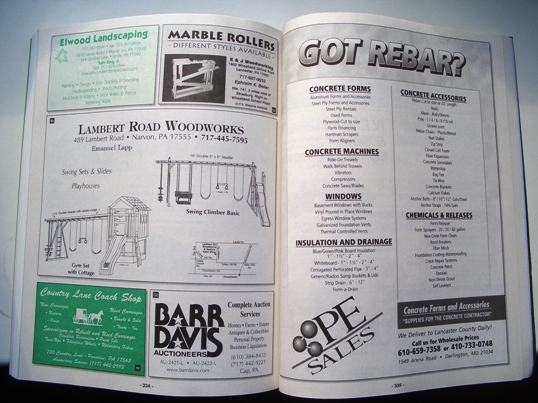 Still, from the point of view of a history buff, Business Directories from history can be a neat thing to look at and see how times are different, and in some cases how things stay the same. Thinking of advertising memorabilia, I have a pencil from either the late 1950s or early 1960s when they used letters, words and numbers in phone numbers. It actually looks modern from a graphic design point of view. Third try to send this message…….just buy AMERICAN……nothing else needs to be said……save our jobs here…. If you happened to watch DIANE SAWYER this past week on WORLD NEWS then you know what I’m talking about……. Before you make a purchase, look to see where it was made !!!!!! Need I say more……. I think the 8 dollars is for the postage and for the time for someone to ready it for mailing. I know that the one I got a few years back was fairly heavy. I prefer to “Buy Local” instead of “Buy American” only entirely because I am Canadian. Mind you, I myself like to buy within the geographical region. If I can buy something produced within the Great Lakes Region, USA or Canada side of the boarder, I probably would, because it got to me quicker than flying something up from California or Mexico. NAFTA, which perhaps at least in part spurred patriotic cries to “Buy American” has been detrimental to all three countries involved, America, Mexico and Canada. But anyway, if you’re there and you’re leafing through the LCBD, go ahead and Buy Lancaster County! first I try to get a good map of the community. Al that sounds like a pretty good strategy! I follow one pretty similar myself. Your last sentence was interesting, when I dropped in to a Byler Amish store in Big Valley, I almost felt like I was intruding on something–though it was a general bulk food-type store with a couple of signs directing you there. One of the ladies working there made it a point to come to me and ask if they could help with something. Maybe they thought I was lost! Richard I have fond memories of a boyhood visit to Hershey; when I visited a few years ago though it seemed like it had become more of a megapark. I’d expect them to have added on since I was there which was probably 25 years ago. Al in Ky. — what a great tip, thanks. My wife wants me to take her to some Amish communities to shop and look around & we will do it this fall and/or next spring if gasoline prices don’t keep soaring up. Erik; that question “Can I help you with something?” is a question that I have been asked frequently in Amish and non-Amish settings, but usually in more rural areas. Obviously I wasn’t there, so I don’t know how she meant it. I do suspect that it was somewhat more of a cultural issue and not so much of a “what are YOU doing in here?” type of thing. The irony of ME trying to explain something to YOU about the Amish approach to business is not lost on me though! Are outsiders welcome in Amish shops? OldKat, good point, and you’re probably right. I’ve certainly had people ask me the same before; what made this seem different was that she sort of beelined to me and also the tone. Not exactly unpleasant, but also actually did sound kind of a bit like “what are you…”. It might have just reflected the fact that they don’t get a lot of English in that particular shop; it was really an “ethnic” shop more than one for the general public. Of course Big Valley doesn’t have anything near the tourist traffic which could factor in as well. In any case they didn’t have the batteries I needed, and I continued to browse a bit before hitting the road. If you’re looking for small businesses local to Lancaster County 9and surrounding areas, really), this is a great resource. 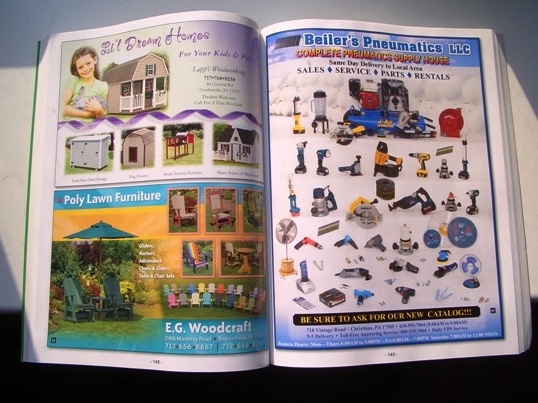 We’ve worked with several business that advertise in this directory.